Does Catholic Tradition Need to Be Rethought? The church claims to root its moral teaching in divine revelation and natural law,” Moran said. “I do not reject these two sources but I strongly criticize the way that the bishops invoke them. Author Gabriel Moran says the Catholic Church has some room for improvement. In his new book, “Missed Opportunities: Rethinking Catholic Tradition,” Moran offers a radical criticism of the language and structure of the Roman Catholic Church. 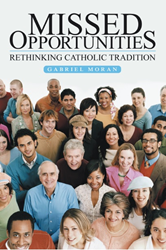 Thanks to his many years of prominence as a voice on religious education, Moran dives into the issues with suggestions for rethinking the Catholic Church’s official teachings on issues such as birth control, abortion and homosexuality. Moran has been a longtime prominent voice on religious education for both the Catholic and Protestant churches. Through his hallmark of close scrutiny of language and posing alternative questions, he has authored many works challenging Church doctrines. For more information, visit http://www.missedopportunities.net. Gabriel Moran has worked in education and religious education for more than fifty years and has published twenty-five books and several hundred essays on issues of community, education and religion. He has been an academic instructor since 1958 in high school, adult education, undergraduate colleges, and graduate schools. Moran resides in Manhattan and currently holds the title of Professor Emeritus of Educational Philosophy at New York University.